The illustration shows a generalized sketch of proposed project goals for the Baseball Safety and Wheelchair Access Project. Click image to see enlargement. A patio with pavestones will be installed as a fundraising strategy to pay for new fencing, field lights, wheelchair access upgrades, shade structures, and other improvements. The patio is located in front of the Little League concession stand and it has been suggested that a shade structure be put over the patio. The field upgrade is expected to increase youth and adult participation in Little League and Girls Softball as well as enable the establishments of a Challenger League, a Little League division for youth and adults who live with disability. A sidewalk with brick galleries will extend from the patio to the bleachers and Little League can use these bricks to recognize sponsors as well as volunteer coaches, and donors who contribute to help sustain the Little League program. This is a fundraising strategy to increase business sponsorships and generate the income necessary for a growing youth program. 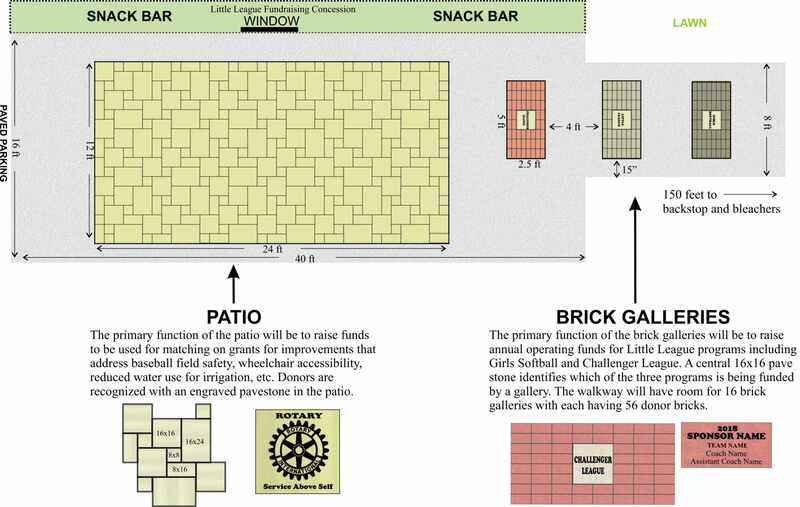 A generalized concept drawing shows the fundraiser patio in front of the Little League concession stand with the sidewalk and brick galleries leading toward the bleachers and dugouts. Click image to see enlargement. Lights need to be moved outside of the playing field and, to accomplish this, the field fencing needs to be reconfigured. This reconfiguration is necessary because the current field uses the property line fence on the south side of the field and moving the lights outside of the fence would put them on private property. The reconfiguration would create a symmetrical field that is generally the same size as the current field but would be shortened by about 15 feet along the south side. The gap creates an opportunity to install a wheelchair accessible loop walkway around the field that will enable parents to watch games and walk for exercise (a suggestion by Little League parents). A higher fence would be installed along this side of the field to protect pedestrians. The wood light poles have structural damage from rot and also from woodpecker holes. This raises concerns about poles breaking or the light racks at the top of the poles breaking off and falling on players. The old lights do not uniformly illuminate the field and outdated fixtures draw excessive amounts of power. New light poles would be metal, the light assembly would uniformly light the field, and light fixtures would use energy efficient lighting. The new poles and lights come with a 25 year maintenance free warrantee so this would save the city money for maintenance. The energy efficient lighting would also reduce power bills for the city. 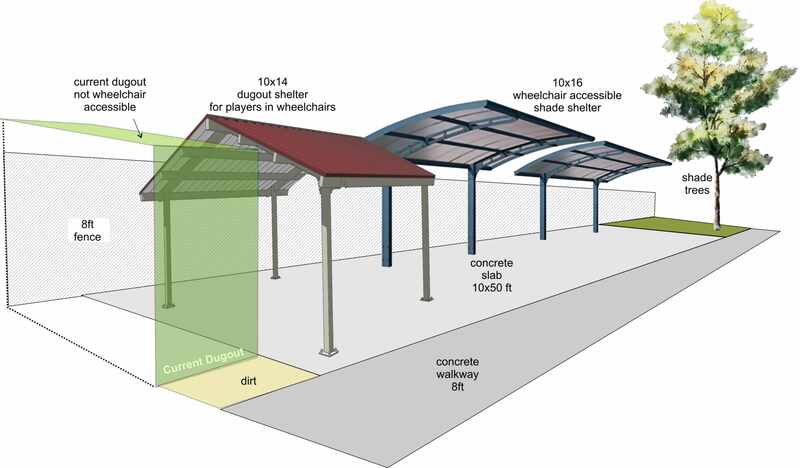 The concept drawing shows a potential shade configuration to accommodate the needs of participants and families who live with disability. Click image to see enlargement. The current dugouts do not have adequate room for ball players or coaches in wheelchairs. To solve this, a shelter with concrete pad would be installed next to the existing dugouts to accommodate participants in wheelchairs. This shelter is a critical element of providing shade on hot days or protection from rain. Individuals who live with disability are likely to be more vulnerable to extremes in temperature and weather. Installation of infrastructure to accommodate individuals who live with disability is a necessary step to enable the establishment of a Challenger League program in Illinois Valley. Individuals with disability often need parents or guardians to be nearby to be available to quickly address the needs of these individuals. For this reason, the concrete pad of the dugout shelter is extended to adjacent shade structures where family members and guardians can enjoy the game and be within a short distance if help is needed. The concrete pad also gives participants in wheelchairs the ability to move independently from the family to the dugout where a gate provides access to the field. Enabling social interaction between families who live with disability and other spectators is a community health and well-being goal of the project. Shade is needed for the bleachers to accommodate spectators who are vulnerable to temperature extremes because of age, disability, or health issues. 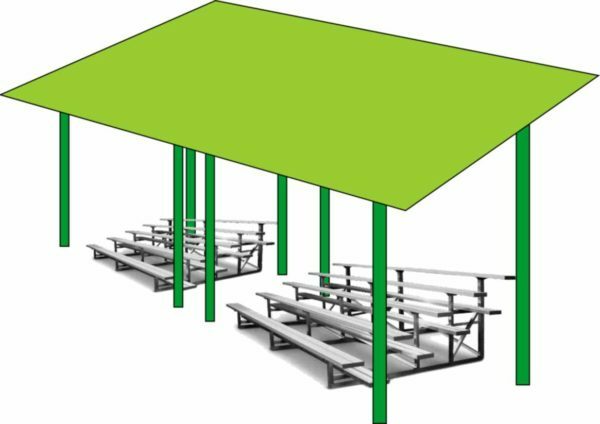 The goal of installing shade for the bleachers is to enable grandparents and residents of all abilities to attend Little League and City League games and enjoy social interaction with other members of the community. A concrete pad will be installed under the shelter for wheelchair access in and out of the spectator area. The concept drawing provides a generalized idea of what the shade shelters might look like. The roof is inclined toward the front because both bleachers face south and east where they are exposed to the sun when it reaches a low angle in the late afternoon. The homemade backstop currently at the field was built and installed by volunteers in the late 1970s using materials that were available at the time. A new backstop designed to meet current Little League standards will replace the old backstop. A bullpen is a fenced area used by pitchers and relief pitchers to warm up before going onto the field. This is an important health and safety feature that helps to prevent pitchers from injuring their arms, a common problem among pitchers from Little league to major league baseball professionals. Reconfiguration of the fencing to make a symmetrical field creates an opportunity for installation of a walking path around the field. This was a suggestion made by Little League parents, mostly mothers who wanted the option of getting some walking exercise during practice and games. The plan is to install a soft-surface path of decomposed granite, which compacts to make a walkway suitable for use by residents in wheelchairs and by parents pushing strollers. Another suggestion is to install outdoor fitness equipment or exercise stations at different points along the path. Outdoor fitness equipment generally provides exercise with a low impact and strain on joints and would be ideal for seniors wanting to get a workout while watching grandchildren play baseball. This suggestion has not yet been approved by City Council. Outdoor fitness equipment can be used by residents of all ages. 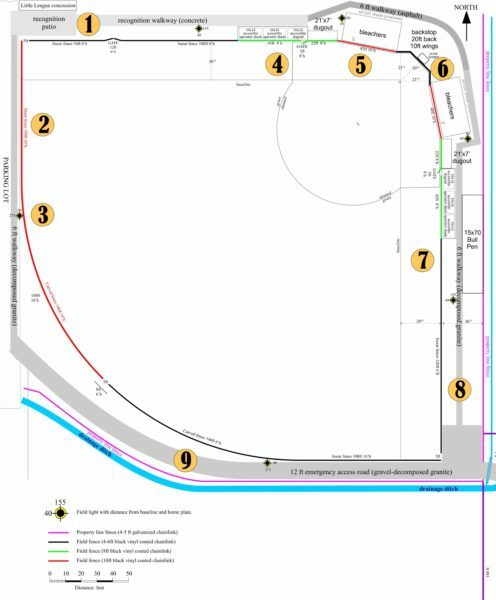 The field reconfiguration will provide adequate room along the south side of the field for a 15 foot wide “road” suitable for emergency vehicle access. This will also create an opportunity to access an unused piece of park property about one acre in size. There have been suggestions to use this acre for a Little League T-ball field or for a dog park.